Wave Motion is devoted to the cross fertilization of ideas, and to stimulating interaction between workers in various research areas in which wave propagation phenomena play a dominant role. The description and analysis of wave propagation phenomena provides a unifying thread connecting diverse areas of engineering and the physical sciences such as acoustics, optics, geophysics, seismology, electromagnetic theory, solid and fluid mechanics. The journal publishes papers on analytical, numerical and experimental methods. 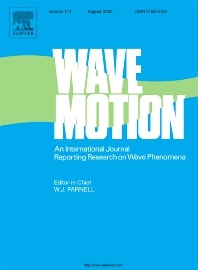 Papers that address fundamentally new topics in wave phenomena or develop wave propagation methods for solving direct and inverse problems are of interest to the journal.